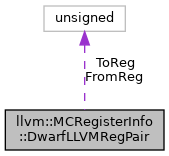 DwarfLLVMRegPair - Emitted by tablegen so Dwarf<->LLVM reg mappings can be performed with a binary search. Definition at line 134 of file MCRegisterInfo.h. Definition at line 138 of file MCRegisterInfo.h. Definition at line 135 of file MCRegisterInfo.h. Referenced by llvm::MCRegisterInfo::getDwarfRegNum(), llvm::MCRegisterInfo::getLLVMRegNum(), llvm::MCRegisterInfo::getLLVMRegNumFromEH(), and operator<(). Definition at line 136 of file MCRegisterInfo.h. Referenced by llvm::MCRegisterInfo::getDwarfRegNum(), llvm::MCRegisterInfo::getLLVMRegNum(), and llvm::MCRegisterInfo::getLLVMRegNumFromEH().